Are Mormons Millennials staying active? Millennials are Leaving Their Churches–What About Mormon Millennials? We are taught to view our fellow members as our brothers and sisters. We are taught to ask questions. Our doctrine is not a laundry list of what we can and cannot do. Shumway elaborated on each point, explaining why she believes The Church of Jesus Christ is retaining more of its young adult membership than other religions are. Shumway believes that The Church of Jesus Christ is doing what Evans’ article asks churches to do: extend more substance to Millennials rather than just more modern services and buildings; encourage them to ask questions; ask for their feedback; strive for political neutrality; and show them a place where they can find the Savior Jesus Christ. As a member of both The Church of Jesus Christ and the Millennial generation, I agree with both Evans and Shumway. Studies conducted by the Pew Research center,universities, and other agencies have increasingly shown that Millennials are leaving the church. These studies also provide insight into the all-important question Evans attempts to answer: “why are they leaving?” I also agree with Shumway that The Church of Jesus Christ offers what many Millennials are seeking in religion: a firm foundation on the gospel of Jesus Christ, a culture that encourages questions, and a place where they can, ideally, find acceptance. Latter-day Saint Millennials are living in the same world as Millennials of other faiths—a world of heated political debate, hot-button social issues, unrest across the globe, as well as personal challenges to faith and belief. The doctrines taught by The Church of Jesus Christ offer an anchor and foundation for young adults confused by the many opinions in the world today. Church leaders don’t attempt to answer every political, economic, or social question; rather, the gospel offers eternal truths and answers to questions about the origin and meaning of life, enabling us to navigate the other important issues in the world with a more sure footing. However, The Church of Jesus Christ is not immune to the Millennial generation’s exodus from church. 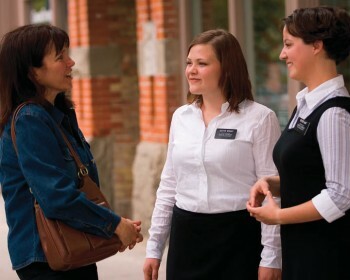 Many young Latter-day Saints stray from or leave The Church of Jesus Christ, some for the very reasons Evans states in her article. There are, of course, other reasons young Latter-day Saints may leave, ranging from issues with Church history to questions on points of doctrine to dissatisfaction with local leaders. I believe, though, that The Church of Jesus Christ offers a sure foundation for me and for other Millennials. I feel very comfortable asking questions, both of the main Church leadership and of my local leaders. I feel that, while some members may be or seem intolerant, that the Church’s official position on many social and political issues is both tolerant and neutral. Most importantly, though, Jesus Christ is at the center of the doctrine. His gospel, mission, and Atonement are the focus of everything we do as Latter-day Saints. That is what keeps me from leaving The Church of Jesus Christ. It’s not the culture of questions, modern services, or political neutrality that keeps me in the church. It’s the gospel of Jesus Christ. One hallmark of The Church of Jesus Christ is our missionaries, who, in the fall of 2013, will number upwards of 85,000. These missionaries are, for the most part, members of the Millennial generation, and are showing their commitment to their beliefs by leaving their families, jobs, and college behind for 18 to 24 months to bring others to the gospel of Jesus Christ. Leaders of other churches are amazed at the sheer number of Latter-day Saint youth who are willing to make such a sacrifice. Such a commitment to missionary service is, for me, an indicator that The Church of Jesus Christ is doing something right with regards to teens and young adults. The Book of Mormon, a companion book of scripture to the Bible, counsels: “It is upon the rock of our Redeemer, who is Christ, the Son of God, that ye must build your foundation” (Helaman 5:12). The gospel of Jesus Christ offers the strong foundation many Millennials seek, and can be “an anchor to the souls” of all of us (Ether 12:4), especially in the turbulent world and time of life in which we find ourselves.